Add soda to make it a perfect party drink or add vodka, gin if you like for that extra kick :) endless options here to try. I made this cucumber lemonade last weekend, now a days I making these kind of drinking in large quantity keep in fridge and relish the whole day. 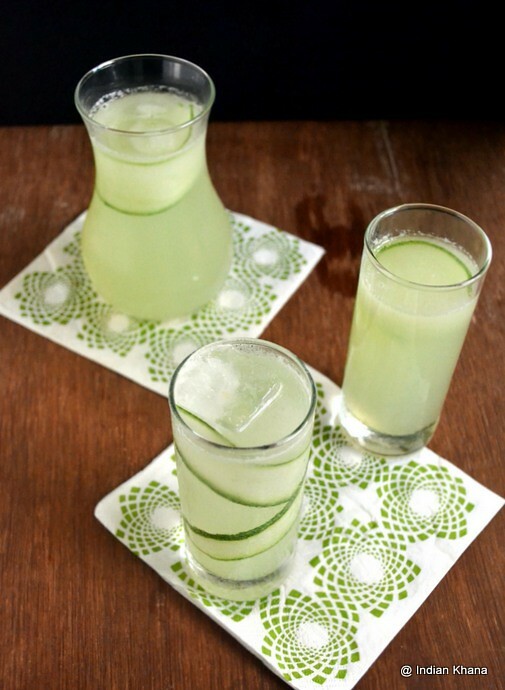 This lemonade is always a great way to add cucumber in our diet, do you know cucumbers are good source of Vitamin B? Cucumber also helps to hydrate body and replenishes daily vitamins, relieves bad breath (Take a slice of cucumber and press it to the roof of your mouth with your tongue for 30 seconds, the phytochemcials will kill the bacteria in your mouth responsible for causing bad breath. ), aids in digestion among other things. 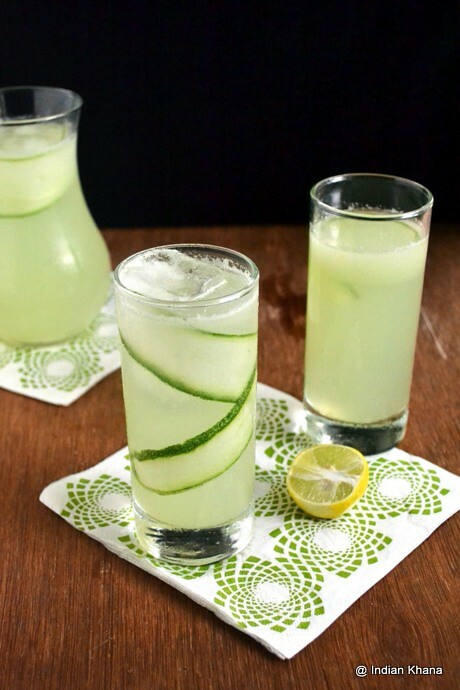 So plenty of reason for your to add cucumber in your diet and how easy can be than to make this cucumber lemonade right? So go ahead and try this out. 2. Chop cucumber (if too many seeds remove seeds), add 2 cups of water in blender with cucumber pieces, sugar. 3. Blend for 3-4 minutes or until sugar dissolves. Sieve drink and add remaining water in a large bowl. 4. Add salt, lemon juice, ice cubes, lemon zest and stir well to combine. Sieve again if preferred. 5. 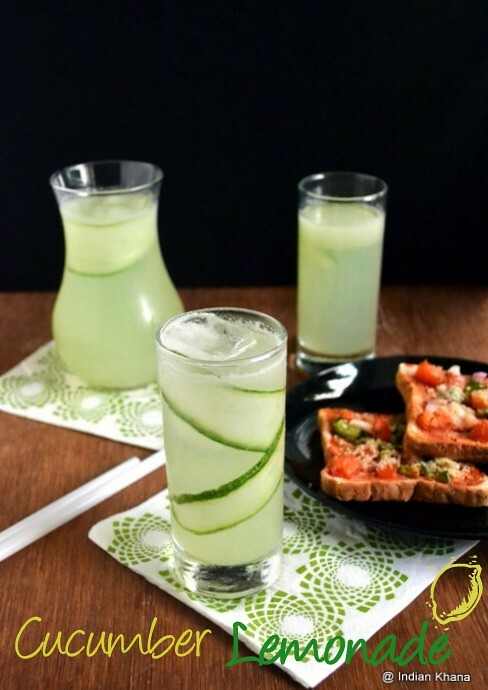 Pour in serving glasses add more ice cubes if required or chill and serve, garnish cucumber slice or lemon wedges. 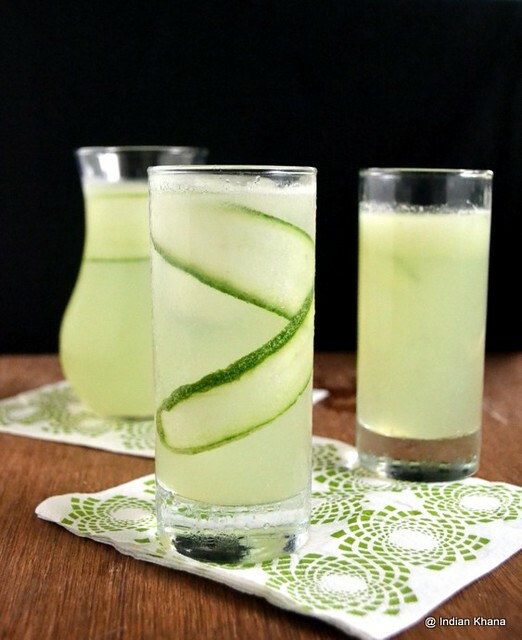 ~ To garnish glass like below picture first add ice cubes in a glass and then keep cucumber slice and twist it and pour drink, lemonade in this case. Ice cubes will hold the cucumber slice in place, in a large jar cucumber slice will float. 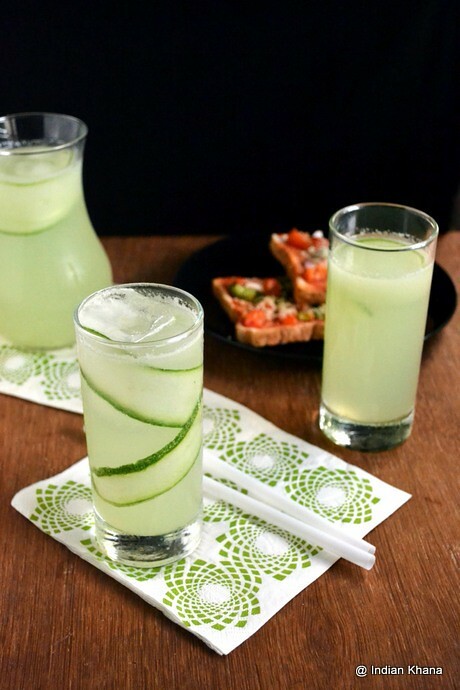 Enjoy this easy and different cucumber lemonade, add a snack along to make a perfect breakfast or evening snack time drink, good for kids in any case. Good idea of using cucumber in this....best for summers..nice one..
Wow I Loved the Green stipes inside the glass :) and ofcourse the drink! Very unique and super refreshing drink,definitely a thirsty quencher. Perfectl 4 summers Looks delicious and as usual, beautiful presentation..